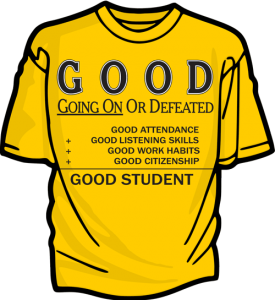 Teachers use the four criteria of the GOOD Program: perseverance, trustworthiness, anti-bullying, and working together to determine shirt winners. If several students exhibit all these qualities, perseverance should be the most important criteria considered. Hopefully, award winners will be students who never give up regardless of how tough things get for them. Some teachers like to have the students vote for the GOOD Program winner(s) in their class. This is a gold, heavy weight blend T-shirt pre shrunk 50% cotton/50% polyester seamless body with set-in sleeves. The lettering on the T-shirt is direct to garment screen-printed with black Plastisol ink. To order GOOD Program shirts, send the following information to the address below or print the Shirt Order Form. Second and third graders are usually given adult small. Fourth and fifth graders are usually given adult medium. *While these sizes will probably be big on the students right now, many children are very proud of their award, and wear their GOOD shirt through high school, college, and even beyond. However, this is not the rule, and if a teacher wants to order a specific shirt size for each student, this is fine.